Reverse Osmosis Process (RO) is a modern day advancement in water purification. The core of the process is a reverse osmosis membrane with tiny pores. When water gets pressured through it, membrane produces two outputs: clean water that's pure enough to have very few contaminants left, and a "dirty" output that in drinking water applications is typically discarded down the drain. Since pressure was used , and membrane pores are tiny to let only very small size molecules (like H2O) through, any impurities that are larger molecules will be rejected by it. More about Reverse Osmosis Process can be read in Water Guide. 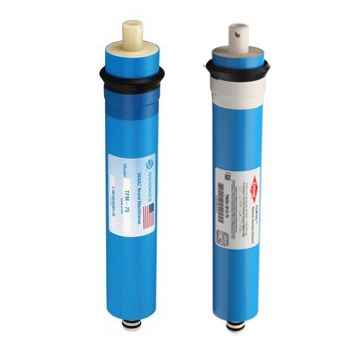 We carry a full line of Residential and Commercial Reverse Osmosis Membranes. RO membranes for under sink and light commercial systems and bottleless water coolers are below. Follow this link for Commercial RO Membranes. DOW Filmtec TW30-1812-36 Reverse Osmosis Membrane. Processes 36 gallons per day. Filmtec TMF-36 RO replacement water filter membrane that fits many standard RO systems. TFM / TFC stands for "thin film composite" membrane. DOW Filmtec TW30-1812-50 Reverse Osmosis Membrane. Processes 50 gallons per day. Filmtec TMF-50 RO replacement water filter membrane that fits many standard RO systems. TFM / TFC stands for "thin film composite" membrane.